Our leather Moccasins are made with the highest quality 100% genuine leather. Moccasins are all handmade. They are made with genuine cow hide. Occasionally moccs may show signs of imperfections or scaring. Mocs are made to be as close as identical as possible however being hand made no two shoes will be completely identical. We examine all our leather used, imperfections will be minor. Size 1- 0-3 months; 4.25 inches heel to toe (10.795cm). Size 2- 3-6 months; 4.5 inches heel to toe (11.43cm). 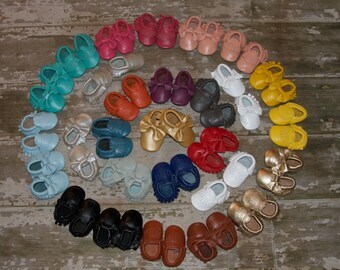 Size 3- 6-12 months; 5 inches heel to toe (12.7cm). Size 4- 12-18 months; 5.25 inches heel to toe (13.335cm). Every pair of moccasins you receive will come in a cloth drawstring bag, as well as a business card. The Fastest and Easiest way is to use a steamer. If you choose to Iron your fringes place a thin cloth on top of the place you want to iron down and go for it. Get 25% off your order when you spend $25.50 at this shop. Discount shown at checkout. Ditto-well made. Thank you for sending them quickly. Made very well. Thank you.